It is as strange as it is true that with the supplies that have lately proved sufficient to feed a world to draw upon the chief trouble with American cookery is its monotony. The American cook has a wider variety of foods at his command than any other in the world, yet in the average home how rarely is it that the palate is surprised with a flavor that didn't have its turn on the corresponding day last week or tickled with a sauce that is in itself an inspiration and a delight, not a mere “gravy,” liable to harden into lumps of grease when it cools. Most of this is simply the result of blindly following tradition. Daughter has accepted mother's precepts, regarding them even as the law of the Medes and the Persians, “which altereth not,” and if it were not that increased prices and, lately, at least, “food regulations,” have veritably compelled her toward a more wholesome simplicity, the United States would probably be what it was called half a generation ago, “a nation of dyspeptics.” And we were a nation of dyspeptics because the great American mother of the latter end of the Nineteenth Century, in spite of all her unequaled qualities in every other direction, and in spite of all the encomiums she received in resounding prose or ecstatic verse for her prowess in the kitchen, was from the points of view of health, economy and wisdom the worst cook in the world. With prices as they are the American housewife cannot afford to use butter and eggs and flour with the prodigality that was a habit with her mother, but so limited is the average woman's knowledge of cookery that these restrictions merely mean more monotony than ever. It is partly to demonstrate that this state of things is unnecessary and that true food economy is not at all synonymous with “going without” that this book has been compiled. 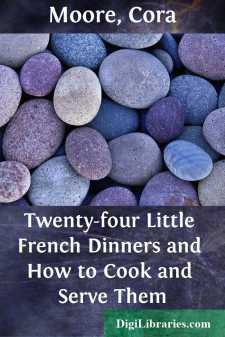 It is upon variety that the French cook confidently relies to make each dish of each meal not just something to eat because her family must have food, not merely a sop to the Cerberus-gnawings of hunger, but a delight to the eye, to the palate, to the stomach—truly a consummation devoutly to be wished for the American home table, and just as possible to attain as it is possible to procure from the grocer or the nearest pharmacist the ingredients by which these wonders are wrought. But the average American woman doesn't look beyond her own kitchen and her own traditional row of spice boxes for her flavorings. She has her “kitchen set,” which ordinarily comprises a row of little receptacles labeled “pepper,” “salt,” “cloves,” “allspice,” “ginger,” “cinnamon,” “nutmeg,” and possibly one or two other spices or condiments—rarely more. With these and a bottle each of lemon extract and vanilla, she is satisfied that she is fully equipped as far as flavoring possibilities are concerned.